With St. Patrick's Day around the corner, I have been looking for some new festive recipes to celebrate the occasion. 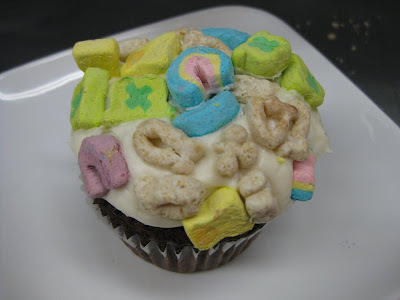 I always enjoy the traditional Irish dishes and green colored beer, but recently found this picture of a Lucky Charm's cupcake, from NY's Flour & Sun Bakery. I love this idea, compliments to the fabulous Cupcakes Take the Cake blog. It is such a simple and fun extra touch...I can't believe I didn't think about adding one of my favorite cereals as a cupcake topping before. This is definitely a great DIY project for kids too. What are you planning on making or doing in celebration of St. Patrick's Day next week? If you have any great recipes, please share them! Happy early St. Patrick's Day from the Life Design Event Planning team. Don't forget to wear your green on Tuesday March 17th.